A toothache is any pain or soreness within or around a tooth, indicated by inflammation and infection. A toothache may feel like a sharp pain or a dull, throbbing ache. 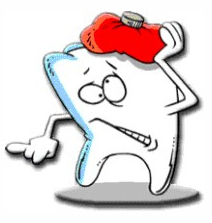 The tooth may be sensitive to pressure, heat, cold, or sweets. In cases of severe pain, identifying the problem tooth is often difficult. Any patient with a toothache should see a dentist at once for diagnosis and treatment. Most toothaches get worse if not treated. Diagnosis includes identifying the location of the toothache, as well as the cause. The dentist begins by asking the patient specific questions including increased sensitivity or if the pain is worse at night. The patient’s mouth is then examined for signs of swelling, redness, and obvious tooth damage. The presence of pus indicates an abscess or gum disease. The sore area is flushed with warm water to dislodge any food particles and to test for sensitivity to temperature. The dentist may then dry the area with gauze to determine sensitivity to pressure. Finally, the dentist may take x rays, looking for evidence of decay between teeth, a cracked or impacted tooth, or a disorder of the underlying bone. Rinsing with warm salt water. Using dental floss to remove any food particles. Taking aspirin or acetaminophen (Tylenol) to relieve pain. The drug should be swallowed—never placed directly on the aching tooth or gum. Applying a cold compress against the outside of the cheek. Do not use heat, because it will tend to spread infection. Using clove oil (Syzygium aromaticum) to numb the gums. The oil may be rubbed directly on the sore area or used to soak a small piece of cotton and applied to the sore tooth. A washcloth soaked in chamomile tea and placed on the infected tooth or swished around in the mouth will help to ease the pain. Toothaches caused by infection or tooth decay must be treated by a dentist. Several alternative therapies may be helpful for pain relief until dental treatment is available. The herb corydalis (Corydalis yanhusuo) may also help relieve toothache pain. Pain also may be reduced using acupressure, acupuncture, or reiki. Acupuncture should be done only by a licensed practitioner. Treatment will depend on the underlying cause of the toothache. If the pain is due to tooth decay, the dentist will remove the decayed area and restore the tooth with a filling of silver amalgam or composite resin. Loose or broken fillings are removed, decay cleaned out, and a new filling is placed. If the pulp of the tooth is damaged, root canal therapy is needed. The dentist or endodontist removes the decayed pulp, fills the space left behind with a soothing paste, and covers the tooth with a crown to protect and seal it. If the damage cannot be treated by these methods, the tooth must be extracted. Prompt dental treatment provides a positive outcome for a toothache. In the absence of active infection, fillings, root canal treatments, or extractions may be performed with minimal discomfort to the patient. When a toothache is left untreated, a severe infection may develop and spread to the sinuses or jawbone, and eventually cause blood poisoning. Maintaining proper oral hygiene is the key to the prevention of toothaches. The best way to prevent tooth decay is to brush at least twice a day, preferably after every meal and snack. Flossing once a day also helps prevent gum disease by removing food particles and bacteria at and below the gum line, as well as between teeth. People should visit their dentist at least every six months for oral examinations and professional cleaning.